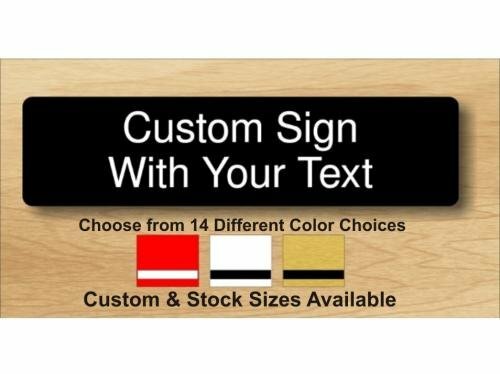 Our Plastic Signs are available in many stock sizes, and a variety of colors. Each sign includes adhesive mounting strips on the back. Custom sizes are also available. Just choose your custom size range based upon square inches (Height X Width) measured to the next full inch. For example a 4 1/2" x 6 1/4" Custom size would be calculated as a 5" x 7" or 35 Square Inches. All pricing listed below Includes Engraving and is for Square or Rectangular Stock & Custom sizes. For Special shapes, call for quote. Nameplates used everywhere to identify the person behind the desk, the teller at the bank, and more. Most have just the persons name, but may include a title on a second line under the name. Order yours today. Our economy desk nameplates are available with either a Silver or a Rose Gold metal stand with many choices for the engraved plate.